It’s not every day you get an opportunity to chow down on some okonomiyaki. Of course, it’s not every or even every millennium that you even hear the word okonomiyaki. 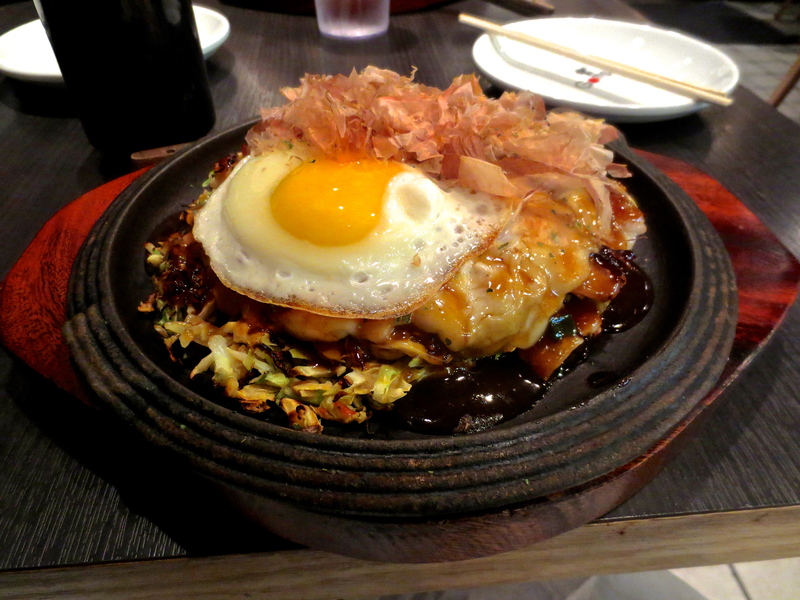 While not nearly as famous as just about any other Japanese food, okonomiyaki is equally, if not more awesome. My first taste of okonomiyaki goes back to my days of studying abroad in Japan. It was described to me as “Japanese Pizza,” which it is, as long as your only requirements for pizza are for it to be edible, flat and have toppings with no regard for the ingredients. Needless to say, okonomiyaki is nothing like a pizza, but it can still be found in the Little Little Tokyo area of West LA at a restaurant called Gottsui. The base of the okonomiyaki is a combination of dough and cabbage. Of course, cabbage usually has no place in my life, my mouth or stomach, but somehow it just works for okonomiyaki. Maybe it’s because it’s topped with so much else that the only thing left of the cabbage is its crunch. As for the toppings, I ordered the Mochi & Cheese, which also came with potato, fish flakes, a special sauce and mayo. I’m not a big fan of Japanese mayo, so I ordered an egg on top instead. You may be wondering what a few of those ingredients are, so I’ll explain. Mochi is Japanese rice cake, which has a crazy texture, and fish flakes are literally that. Except something really cool happens when they are put on hot food. Check out the video below to see. Yes, they look alive. No, they aren’t. So to make a long story short, the food was fantastic. It’s been a frightfully long time since I resided in Japan, but Gottsui really brought back some memories.